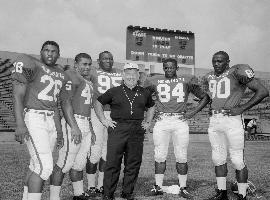 In 1965, Duffy Daugherty won the national football championship with All-Americans (l to r) Clinton Jones, Bob Apisa, Bubba Smith, Gene Washington and George Webster. In December MSU hosted Tuskegee University at Jenison Fieldhouse to honor the “Game of Change” that took place a half century ago in that venerable venue. That was a second-round NCAA tournament game between Loyola of Chicago and Mississippi State. The game, pitting an integrated team against a segregated team from the south, proved to be a milestone in the desegregation of sports in America. Travis Trice, a sophomore guard on the current MSU team, expressed pride in learning that MSU had played such a historic role. In fact, MSU played a far bigger role in the desegregation of sports in America—something that’s worth remembering. First, let’s recap the significance of the 1963 NCAA tournament game. Back in those days SEC sports teams were segregated. Moreover, six months before the game the governor of Mississippi had tried to prevent James Meredith from attending Ole Miss. Segregationists did not want the Bulldogs playing Loyola, which started four black players, and a local judge issued an injunction to prevent the team from leaving the state to play that game in East Lansing. MSU Athletics Director Mark Hollis calls it “the beginning of the end of segregation in college sports.” For the record, Loyola won 61-51 and went on to win the NCAA tournament. MSU football was integrated in 1913, when John Macklin welcomed Gideon Smith—the second African American to play college football. In the postwar era, Biggie Munn became one of the first coaches to recruit black players; in 1951, Hall of Famer Don Coleman became MSU’s first black All-American. Black football players for MSU in the 1940s included Jesse Thomas, who made All-American on offense one year and on defense the next. In 1954, Clarence Underwood, who eventually rose to become MSU athletics director, was an army private when he saw MSU beat UCLA in the Rose Bowl. Underwood—my colleague in the MSU Alumni Association back in the 1980s—told me that his decision to come to MSU was based on his seeing black and white players on the same team working together and celebrating with each other, something he had never seen in his native Alabama. “Biggie opened the door, but it was Duffy (Daugherty) who blew it wide open,” says Larry Bielat, former player, assistant coach and radio color analyst. Duffy’s national championship teams of 1965 and 1966 were led by black players such as Bubba Smith, George Webster, Clinton Jones, Gene Washington and Charles “Mad Dog” Thornhill—outstanding athletes who could not play for segregated schools in their home state. In 1967 Smith, Webster, Jones and Washington comprised four of the top eight NFL draft picks—with Smith the No. 1 overall pick. After MSU’s success in 1965, previously segregated schools began to recruit black athletes. Just three years later, Alabama desegregated its football team as well. In 2008, an HBO documentary, Breaking the Huddle: The Integration of College Football, says that Crimson Tide coach Bear Bryant decided to integrate his team after losing to Southern Cal in 1970 and noting that black players accounted for USC’s touchdowns. That may have been the trigger, but Bryant was likely influenced by the successful integration achieved by his colleague and friend Daugherty. As a historical addendum, it should be noted MSU’s leadership in desegregation was not limited to sports. The U.S. Civil Rights Commission was founded in 1957 and its first chairman was MSU President John Hannah, who provided tremendous leadership to the then-fledgling organization. MSU’s game against Tuskegee not only served to honor a historic milestone but also reaffirmed one of the university’s time-honored values. For Travis Trice and other young Spartans, I hope this helps flesh out a more complete story.